The mule train has arrived and I have no problem stepping aboard. 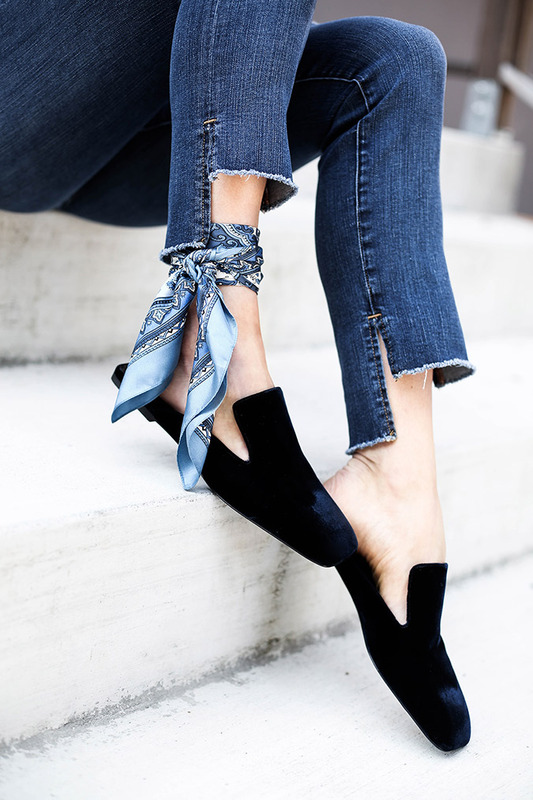 These velvet backless mules are the shoe of the season and you can bet they’ve made their way into my closet. Erica of HonestlyWTF paired hers with a trendy pair of step hem jeans and a handkerchief embellishment. I love it! 2. Wear the Wild West. One of my favorite traditional fall uniforms has to be a flannel button up. 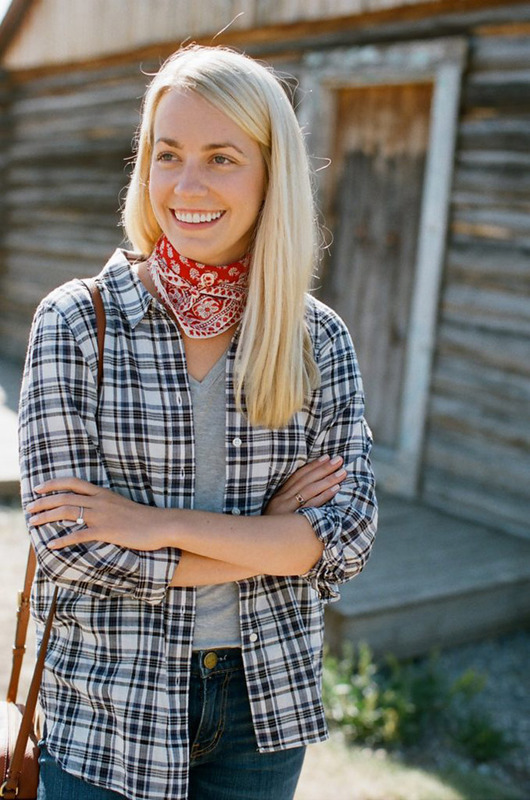 Jillian of Rhyme & Reason looks like she’s enjoying the season in her adorable flannel and neckerchief combination. 3. Be a bell-sleeved beauty. This month it’s all about the details. Whether it’s a bell-sleeved blouse or lace-up heels, an unexpected embellishment goes a long way. Amanda of Enchanting Elegance looks darling in her LC Lauren Conrad Lace Fit & Flare Dress—one of my very favorite looks this month! When in doubt, classic black is always a good idea. Break up the color palette like Stesha of Classic & Bubbly did with her gray booties and handbag. I love how Stesha shows us that you can easily transition your favorite off-the-shoulder top into the next season, so don’t pack them up just yet! Add a little dimension to your fall wardrobe with a fringed sweater like this one on Kathleen of Carrie Bradshaw Lied. There’s nothing better than an ultra-soft sweater that’s both fashionable and functional. As if I could love sweaters more than I already do, Bethany Kate is reintroducing me to the wonders of sweater dresses. This chunky knit turtleneck sweater was made for over-the-knee boots on a cozy fall day. 7. Mad for all kinds of plaid. Mixing patterns can be difficult to pull off but not in this case. Courtney of Color Me Courtney dressed up two of her favorite plaid pieces that surprisingly work so well together. Her cherry red lipstick and bag are the perfect finishing touches. Casual blazers are the new cardigans. 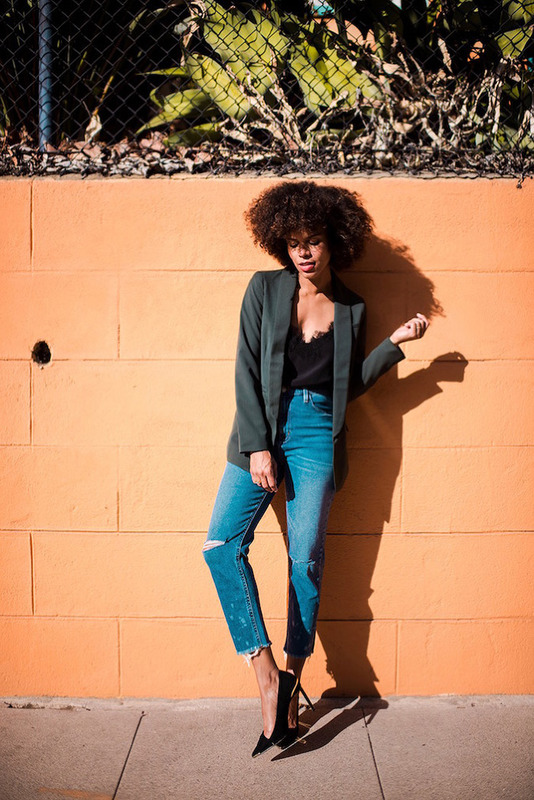 Add a little structure to a casual ensemble like Grasie Mercedes did with her olive green blazer and killer pumps. Casual Fridays have never looked so cool. 9. Join the military trend. Not only are military jackets hot this season, but so are military-inspired blouses and trousers. Think billowy blouses and high-waisted pants with plenty of buttons. Mary of Happily Grey looks ultra-chic in her military getup. What would this roundup be without some chunky knits? I’ve never met a sweater that I didn’t like, and Peony Lim’s cable knit cardigan is no exception. Mix in a woven bag and your favorite boyfriend jeans for the coziest outfit around. Which one of these style tips is your favorite? I have my eye on those mules! Let me know your fave in the comments.